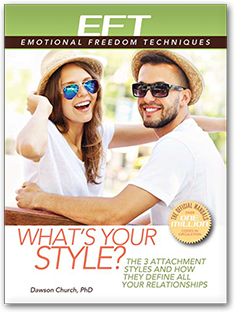 There are over 5,000 stories on this web site written by people who have recovered from a wide variety of physical and psychological challenges using EFT. This anecdotal evidence is consistent with rigorous scientific research showing that EFT is an "evidence-based" method. 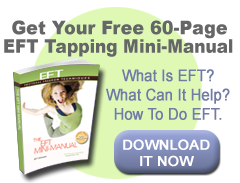 Studies show that EFT is effective as a self-help tool, while it is also used in many healthcare settings by medical and mental health professionals. This EFT research bibliography lists more than 100 papers published in peer-reviewed professional journals. To provide a context for this research, which has been shaped by the criteria for evidence-based treatments defined by the American Psychological Association's Division 12 Task Force on Empirically Validated Treatments, we begin with on overview of the criteria. The abstracts are organized into a number of categories. These include Outcome Studies, Clinical Reports, Mechanisms Papers, Review Articles and Meta-Analyses, and Skeptical and Opposing Viewpoints. Outcome studies are further divided by condition, such as anxiety, depression, and posttraumatic stress disorder (PTSD). From the links at the top of this page you can jump to any of these sections immediately. EFT Universe supports the evidence-based standards defined by the American Psychological Association (APA) Division 12 (Clinical Psychology) Task Force ("APA standards" for short). These define an "empirically validated treatment" as one for which there are two different controlled trials conducted by independent research teams. For a treatment to be designated as "efficacious," the studies must demonstrate that the treatment is better than a wait list, placebo, or established efficacious treatment. To be designated as "probably efficacious," a treatment must have been shown to be better than a wait list in two studies that meet these criteria, or are conducted by the same research team rather than two independent teams. The results of all the published studies listed below are statistically significant. Many of them are randomized controlled trials or RCTs, a design generally regarded as the Gold Standard of research. 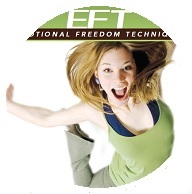 EFT has met the APA standards as an "efficacious" treatment for phobias, anxiety, depression, and PTSD. There are several definitions in the field of medicine (as distinguished from the field of psychology) of what constitutes an evidence-based treatment. One of the most useful comes from the US government's National Registry of Evidence-Based Programs and Practices (NREPP). It requires a standardized description of the method in the form of a manual and training materials, documentation that the treatment was delivered with fidelity to that method, the use of validated and reliable outcome measures, corrections for dropouts (such as an intent-to-treat analysis), appropriate statistical analysis, sample sizes sufficient to produce a probability of p < .05 or better, and publication in a peer-reviewed professional journal. NREPP has validated Thought Field Therapy (TFT), on which EFT is based, as an evidence-based practice, and this designation for EFT is expected to follow shortly. EFT has been researched in more than 10 countries, by more than 60 investigators, whose results have been published in more than 20 different peer-reviewed journals. These include distinguished top-tier journals such as Journal of Clinical Psychology, the APA journals Psychotherapy: Theory, Research, Practice, Training and Review of General Psychology, and the oldest psychiatric journal in North America, the Journal of Nervous and Mental Disease. In the US, these range from Harvard Medical School, to the University of California at Berkeley, to City University of New York, to Walter Reed Military Medical Center, to Texas A&M University, to JFK University. Institutions in other countries whose faculty have contributed to EFT research include Staffordshire University (United Kingdom), Lund University (Sweden), Ankara University (Turkey), Santo Tomas University (Philippines), Lister Hospital (England), Cesar Vallejo University (Peru), Bond University (Australia), and Griffith University (Australia). A number of meta-analyses, combining the results of many RCTs that meet the APA standards, have been published. Meta-analyses are considered to be at the top of the "hierarchy of evidence" because they combine the results of a whole body of scientific literature to measure "treatment effect." This uses a measure called Cohen's d (Cohen, 1988) or a slightly different calculation called Hedges' g.
This scale ranges from a small treatment effect, d = 0.2 to a moderate effect, d = 0.5 to a large effect of d = 0.8. Meta-analyses show EFT to have a large treatment effect for anxiety, depression, and PTSD. For anxiety, d = 1.23 (Clond, 2016), for depression d = 1.31 (Nelms & Castel, 2016) and for PTSD, d = 2.96 (Sebastian & Nelms, 2016). The EFT Universe training and certification program is based on "Clinical EFT," a consistent and reliable protocol supported by this extensive base of evidence and clinical practice, and in conformity with the APA standards. EFT Universe trainings are accredited for CE/CME for doctors (American Medical Association), nurses (American Nurses Credentialing Commission), psychologists (American Psychological Association), social workers (NASWB), and many other professional organizations. There are several kinds of research papers listed on these pages. The first is "outcome" research. These studies compare the medical or psychological outcomes of two groups of people with similar symptoms, or the same sample before and after EFT. Outcome studies measure changes in, for instance, pain, depression, or PTSD symptoms. While an outcome study is designed to answer the research question "Does this work?" the second kind of paper asks the question "How does it work in the body?" With EFT having been shown in many outcome studies to work very quickly and reliably for a variety of ailments, researchers have also studied the physiological mechanisms of action by which such rapid healing is possible. So the second category of paper you will find below is mechanisms papers. The third category of paper is the "clinical report." Clinical reports describe the use of EFT with special groups, such as people with epilepsy, veterans, children, refugees, or prisoners. They may present a single case. Next, there are "review papers." These systematically gather together all the published evidence about a topic, present it in a structured manner, and evaluate that body of knowledge. There is also a section listing papers written by skeptics and opponents of EFT. Despite a large and consistent evidence base, there are many professionals who remain unconvinced, some of whom actively campaign against the use of EFT or further research into EFT. You can make up your own mind after reading the arguments before and against. For convenience, and to organize the large number of studies referenced on this site, outcome studies are presented first, by the condition for which data was collected, e.g. Depression, Pain, etc. The titles of studies are listed below the heading. If a meta-analysis is available, it is always listed first. If you click on a title, you jump to the paper's abstract, and if available, the full text of the paper, or a location online where you can obtain it. A study in which the primary outcome was PTSD symptoms might have also collected data on secondary outcomes such as pain. If so, the study may appear under both headings. The abstract tells you the treatment protocol, number of subjects, assessments used, change in symptoms, and statistical significance. Below outcome studies, clinical reports, mechanisms papers, and review articles are listed. All the studies listed on this page have been published in peer-reviewed professional journals or submitted for publication after being presented at professional conferences, with a few exceptions. These studies are listed at the bottom of the page under "Informal or Unpublished Research." These are listed in a separate section since they have not met the rigorous standards inherent in peer review. 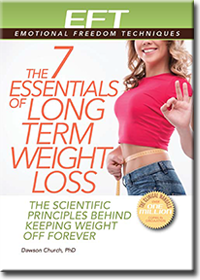 Many of the studies on this page have been performed by a team of dedicated volunteers at the National Institute for Integrative Healthcare. A great need exists for money and expertise to perform the next level of research on EFT, to pay for genetic tests, lab assays, and data analysis. If you would like to make a tax-deductible donation or bequest to EFT research, you may do so here through the National Institute for Integrative Healthcare web site. EFT Info and Disclaimer Document. Outcome studies compare outcomes, e.g., levels of pain, degree of depressive symptoms, either between two groups, or between the same people before and after EFT. The headings below tell you, in alphabetical order, the conditions for which data was gathered in the trials below them. Clinical Reports describe the use of EFT with various groups, e.g., university students, prisoners, refugees, or abused children. They may contain quantitative data such as scores on symptom assessments or they may describe the ways in which practitioners can work with this population. EFT: Finally, a unifying theory for the practice of holistic nursing, or too good to be true? The "mechanisms of action" for a technique such as EFT describe what is happening in the body during application of the technique. These papers describe the neurological, epigenetic, psychoneuroimmunological, and hormonal pathways engaged by EFT. There are many professionals who reject EFT categorically and sometimes vehemently; one prominent opponent calls EFT and similar methods “possible threats to the science of psychiatry and psychology” (Devilly, 2005). Skeptics and opponents discount the above research and argue that the effects of EFT are due to placebo, the nonspecific gains found in any form of therapy, and other factors. The Wikipedia entry for EFT and most other forms of non-drug alternative therapy are tightly controlled by a group of skeptics who state that these methods possess the characteristics of “pseudoscience.” In the entry for EFT, these Wikipedia editors feature newspaper reports, opinion pieces, and review articles attacking the method but censor the posting of any of the more than 100 outcome studies, randomized controlled trials, meta-analyses, and review papers supporting the method. The opposition to EFT is understandable. EFT's combination of Western psychotherapy and acupuncture is controversial. Any new therapy faces an uphill journey to acceptance, since research funding goes to established methods, while a large body of existing professionals are trained in and familiar with these methods. This results in a "translational gap," a very long lag between the discovery of effective new therapies, and their implementation in primary care. According to a US government analysis, the translational gap averages 17 years (Institute of Medicine, 2001). Only 20% of new therapies succeed in crossing what the report calls a "quality chasm"; the benefits of the remaining 80% are forever lost to patients. While the skeptics are successful in blocking the majority of new treatments, it is our goal to see that the millions of people suffering from devastating conditions such as PTSD and major depression have EFT as an option in primary care. Below is a selection of articles published in peer-reviewed journals that criticize EFT. You can decide on their merits for yourself. Some comments on “Energy psychology: A review of the evidence.” Premature conclusions based on incomplete evidence? These studies have been presented at professional conferences or informally presented, such as in books. They have not been peer reviewed and are thus not to be relied on for the empirical rigor that the review process brings. They should be regarded as suggestive only.